Microsoft Outlook (not “Outlook Express”), part of Microsoft Office, is widely used for sending, receiving, and filing email, email addresses, and even scheduling events. Outlook, for versions prior to 2003, tends to corrupt (and lose everything) if the total size of stored email exceeds 2GB (2048MB). Many folks will never exceed that limit (usually it takes thousands of emails to reach 2GB), but some have and will. First check your version by, in Outlook, clicking Help, then About. Right click on that PST file, then left-click on Properties and you’ll see file size. The properties will also indicate if you’re looking at the correct file: For example, if the Date modified shows “?Sunday, ?September ?16, ?2007, ? ?6:59:44 AM” suggesting nothing’s changed in there since 2007, but you know you worked in your Outlook only yesterday, you can be certain you’re looking at some old irrelevant copy of the file and you’d better find the current one before proceeding. While there: That file Outlook.PST contains all your email settings, all your contacts, and all your old email. Why not burn a copy of it onto a CD or DVD disk or drag it onto a USB drive or external hard drive? Outlook itself can give you the same size information quickly – perhaps more easily. Open the Mail window in Outlook and with the Navigation Pane showing your hierarchy of mail folders, right click on any folder, click Properties, and then in the Properties window click on the Folder Size button. This will report how much data is stored in this folder and all its subfolders. In particular, if you right-click on the top folder, Personal Folders, you’ll find the total size of stored e-mails, with a breakdown by folder and subfolder. 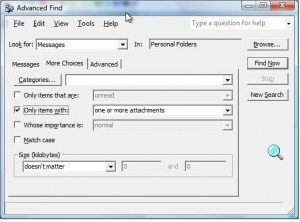 You can use the Outlook’s Archive feature (On the File menu, click Archive) to store some older messages in an archive. Or, you can just go through and do a cleanup deleting older items, and especially those with large attachments. Outlooks internal Advanced Find can be invoked with Ctrl-Shift-F. Once in there, click the Advanced tab, then the More Choices tab (see image below). In there, you can specify searching, say, the sent items folder, for all emails with attachments, and perhaps delete the real fatties. 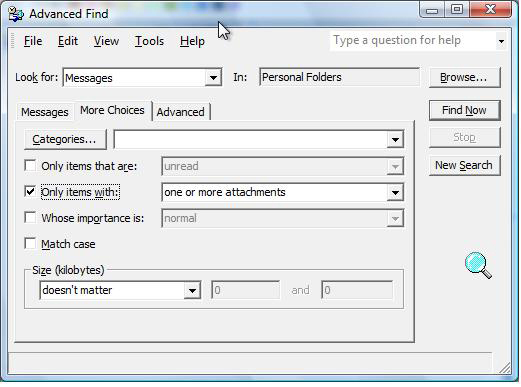 Often emails in the Deleted items folder, especially older ones, can go, and many of the things you have stored in the Sent Items folder are things you may not really need to keep forever. Alexander Censor, M.S., aka “Computer Doctor,” is the former writer of Smart Computing Magazine’s Q&A column and many reviews and instructional articles.